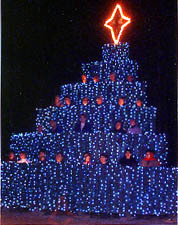 1999 was New Colony's first year doing a tree. 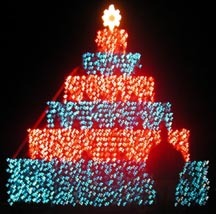 Their OUTDOOR tree has 6 tiers. They use a single MidiLite frame (42 channels) and do something unique by running 3 of the colors in a horizontal matrix and the other 3 in a vertical matrix. They use auxiliary channels for their stage, cross, star and manger. Their 2000 show had some cold, damp weather (outdoor show) but had good turnouts regardless and they are looking forward to another great year! Tony used a PC running Windows 98 & Cakewalk Pro Audio 9 which play back the digital audio tracks and MIDI tracks for controlling the tree lights. 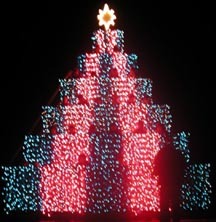 In 2003, they built a new tree and all new commercial grade lights. One of their performances was rained out, but otherwise they had a trouble free performance. Even if you're on a limited budget and have a small group, with the Lords help, His name can be praised. We had an average attendance of 250 at each performance, and for a remote community like ours, that was great. With more time for preparation next year, we are looking forward to another great time in the celebration of the birth of our Savior.